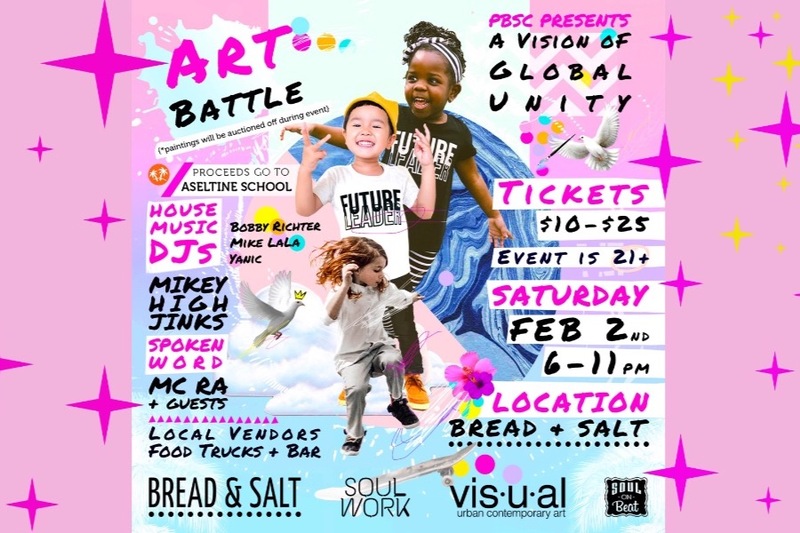 San Diego, CA, January 12, 2019 — A Vision of Global Unity, hosted at Bread and Salt, aims to raise money and awareness for San Diego’s at-risk youth by providing a creative outlet for youth to excel. Proceeds will benefit the Aseltine School’s Fine Arts Program. See five locally recognized artists engaging in a collaborative Art Battle, each creating a unique 6’x4′ art piece all with an end goal of spreading awareness, generating unity, and giving rise to change for a better tomorrow. Attendees will have an opportunity to bid on the final art piece at the event. In addition to the Art Battle, there will be various other creative forms of art including spoken word, live music, house music DJs, and a variety of local vendors. With an aim “to educate and empower students to become critical thinkers of world”, this event supports the vision that all children are capable of flourishing to their highest abilities with the proper tools and support. By bringing together some of San Diego’s influential artists, musicians, and party-goers, this event is PBSC’s way of lifting up our local at-risk youth. More information about the event can be found on our Facebook Event Page and tickets may be purchased on our EventBrite page. Ticket prices are as follows; $15 for Presale and $20 at the door. PBSC is a local women’s group dedicated to nurturing, educating, and empowering each other to strive and achieve personal and professional goals while giving back to the community through monthly contributions and philanthropic volunteer activities.